Tom King’s got big plans for the next few months of Batman. And the ending is a big old fight between the Joker and the Riddler over who should have the right to kill Batman. It’s like Civil War, but with bad guys and hopefully no character assassination. King outlined his upcoming “The War of Jokes and Riddles” plot at Fan Expo Dallas. The basic gist (via Batman News) is that, early on in Bruce Wayne’s Batman transformation, the Riddler and the Joker decide that they are his one true nemesis. And they go to war to make sure that only they get to destroy Batman. 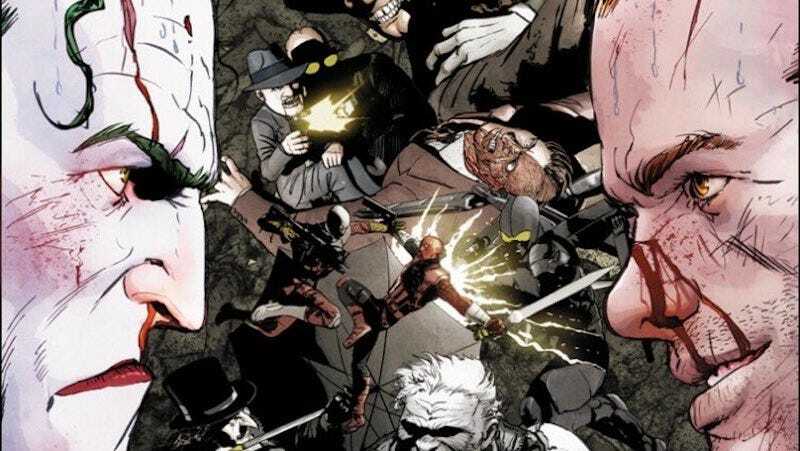 Along the way, the members of Batman’s rogues gallery pick sides, so we’ll get to see things like Deadshot fight Deathstroke and Solomon Grundy fight Killer Croc. Poor Batman, trying to keep the peace in Gotham while every extra-crazy/extra-powerful villain is in the middle of a war. King clarified at Fan Expo Dallas what those eight parts will look like. Issues 25, 26, 28, 29, 31, and 32 will be the main story, while issues 27 and 30 will look at the life of a z-list villain when the big boys have a blow-out. Those issues will also have a guest artist, while Mikel Janín will be the artist for the other six issues. Batman has one of the most recognizable rogues galleries out there, so it’s always fun to pit them against each other. Plus, since they’re villains (and, you know, the Joker’s not exactly prone to linearity), it’s not out of character for them to rampage around causing loads of damage, like it is when the heroes fight each other. Batman’s Gotta Be a Lousy Lay, Right?